The company was engaged to supply and install 5 classrooms, in ground hydraulics, install gas and electrical services, footings, kerb and guttering of classroom structures, landscaping, external paving and shade structures. 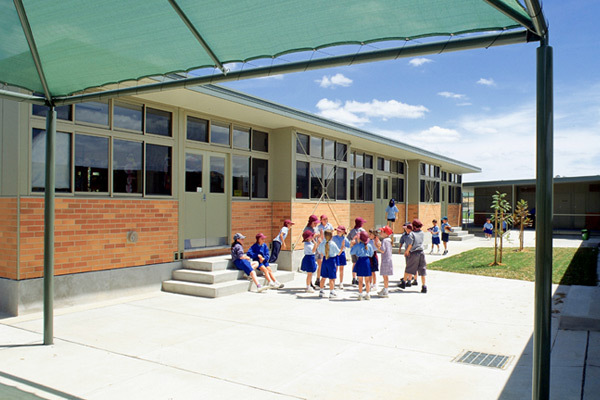 The classrooms were constructed at James Hardie Systems Elizabeth factory in South Australia and then transported in modular form to the Nicholls site. Once erected they only required a final coat of paint, carpet and services fit off to be completed. Time constraint imposed by the client required an innovative solution, as conventional construction could not meet the designated completion date.